Instead of managing your objectives one by one it is also possible to upload a CSV file with your objectives. Press Import Objectives in the upper right corner to start uploading your CSV file. The CSV file should contain headers and should have less than 1000 lines. The Load Factor is expressed by and number divided by 100 and will look something like this: 0.75 . This number cannot be greater than 1 (100%). Please note that revenue and/or load factor goals are monthly and should be > 0. 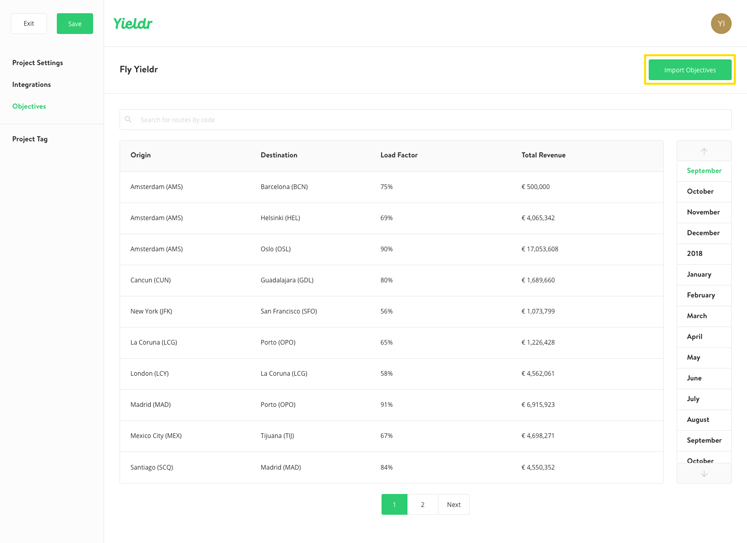 They are only applicable for the flights you have in the Yieldr Platform. The monthly route based objectives in the CSV file will overwrite the objectives that are currently set for that route in that month.